The title sounds like the game Duck-Duck-Goose but, although there are ducks and a goose, the hero of the story is a moose and this is no game. It's about finding a home. 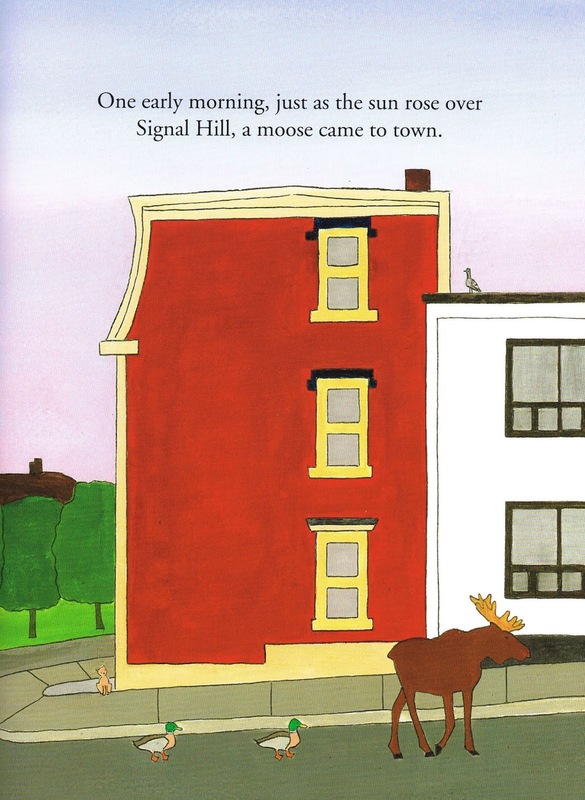 A moose is wandering the streets of St. John's, Newfoundland. It happens. But, he's accompanied by two mallards who follow him everywhere. He's perplexed by their attentions and "It was beginning to put him in a foul mood." His wanderings are not aimless: he's looking for a new home for his ducks. But, like Goldilocks, somethings just don't fit. A park has swans that make the mallards nervous. The downtown has pigeons. The harbourside has seagulls and even a menacing chicken. Location after location don't seem to work for the ducks. Even the restaurant Mallard Cottage looks to have potential until they check out the menu which apparently highlights wild game. (Oh dear!) 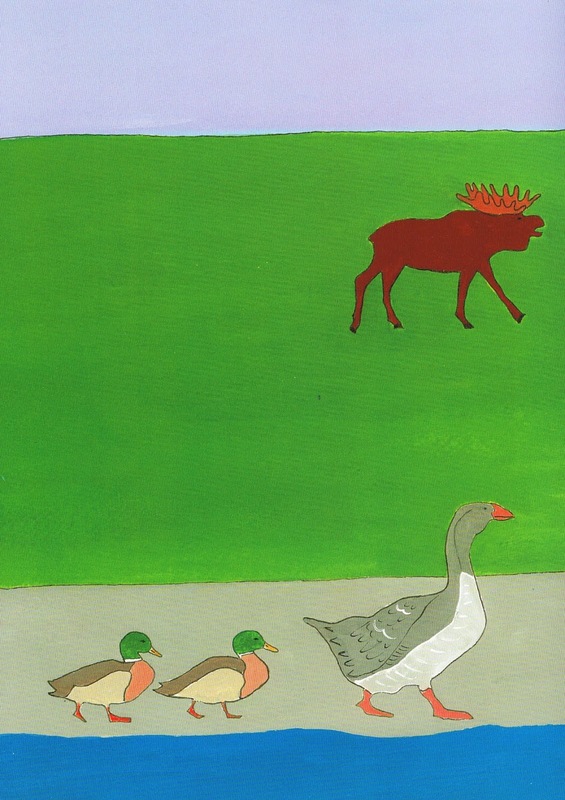 It's not until a goose, which Lori Doody identifies as a Graylag Goose, a Eurasian species that is only rarely found in North America, agrees "to take the mallards under his wing" that the moose know his quest is complete. 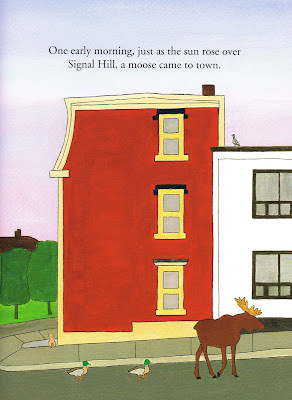 Like her previous picture books Capelin Weather and The Puffin Problem (Running the Goat Books & Broadsides, 2017), Lori Doody embeds the reader in a Newfoundland setting of hilly streets, buildings of colourful clapboard siding, shorelines, animals and whimsically-named businesses. Her art is the centrepiece of Mallard, Mallard, Moose though the story itself is charming and feasible. That's the thing with Mallard, Mallard, Moose. You know the story could be true. Moose in Newfoundland? Yep. Mallards too? Yes. One species imprinting on another? It's happened. And the Graylag Goose, which extraordinarily was a resident of St. John's for ten years, probably encountered more than a few mallards. This could be their story, and Lori Doody makes it all the more authentic with her folksy fine art. The mixed media on paper allows her to emphasize the depth of colour and the simple lines of a St. John's landscape and transport readers to a storefront window or park bench to observe the goings-on. It's bold and humble and concrete and pragmatic, and it works so well. 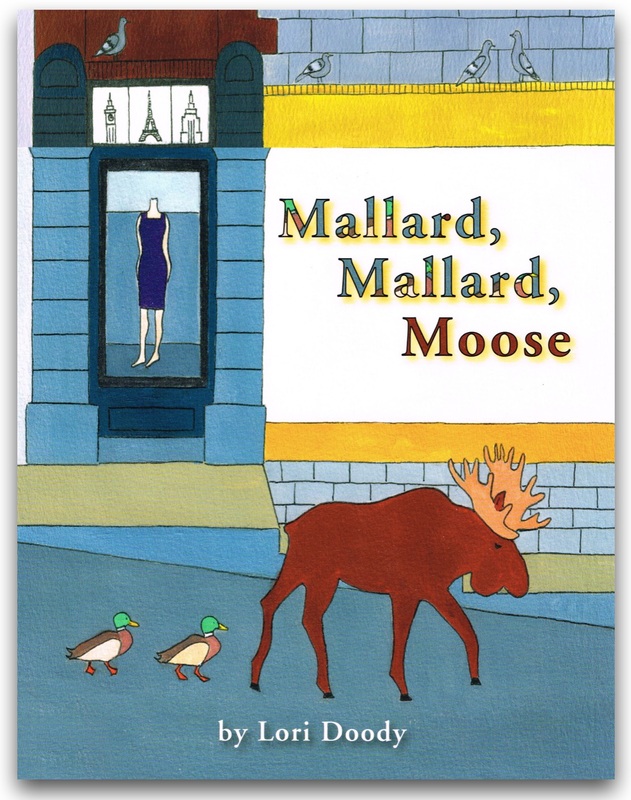 I love the drama and the earthiness of the story and art in Mallard, Mallard, Moose and I expect and hope that we'll continue to see Newfoundland in Lori Doody's picture books in the future.